Leonard Linder (White Plains) - Book Appointment Online! I treat a variety of neuro-musculo-skeletal conditions which can be either due to an acute injury or from a chronic condition. My goal is to not just relieve symptoms but to improve function and correct a problem to prevent it from returning. I utilize a variety of techniques to achieve this, such as: manual manipulation, motorized traction, instrument adjusting as well as incorporating several modes of physio-therapy. 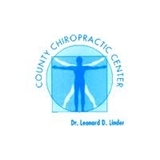 Dr. Linder was friendly, engaging and highly knowledgeable. I would definitely recommend him for your chiropractic needs.